Pardon our dust as we construct this site. The JS Bach Foundation of America will deliver original user-generated content, which will be added as we progress. Inside you will find a wide array of interests. To find out more about our mission, visit our Mission page. How Did Bach Write His Music? Click on the Music link and find out. 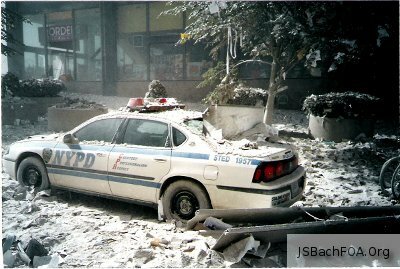 What's the Connection Between Bach and the World Trade Center Attack of September 11, 2001? Original photographs taken from the WTC during and immediately after the attacks. Located in the History and Literature Section. Ed Kotski presents a Simple Way to Play Chess Well. Learn how to balance a chemical equation here.